Security camera installation in Jacksonville, FL and surrounding areas. What’s so great about HD-over-Coax? HD-over-Coax is a new analog high definition (HD) video standard transmitting over coaxial cable. The technology provides transmission of HD video as well as audio, and two-way control data over long distances. You can implement an HD system using the same coax cables that your existing analog system is running on. HD-over-Coax installs just like analog cameras and gives you up to 1080p High Definition. No fiber, no configuring, and no special training required. And, you don’t have the limitations on distance like you find in IP and HD-SDI systems. HD-over-Coax (High Definition Composite Video Interface) is an over-coaxial-cable analog HD video transmission standard developed specifically for the CCTV industry. HD-over-Coax composites video, audio, and data control signals together and then transmits them over one coaxial cable, simplifying installation. Using RG-59 cable, HD- over-Coax transmits HD video over distances in excess of 500m (1640 ft.) with no expensive repeaters or signal boosters. The HD-over-Coax solution incorporates both cameras and DVR’s. The technology currently offers two specifications: 1080p (1920 x 1080) and 720p (1280 x 720). In addition, the technology features Auto Signal Compensation (ASC) which provides extremely low signal distortion for long-distance transmission. Analog systems, based on coaxial cabling, still dominate today’s video surveillance market — there are approximately 400 million analog cameras in use throughout the world. The demand for high definition from end-users is undoubtedly increasing. However, the need to change the cabling for a HD system can result in much higher installation and operational costs. With no new cabling or IP hassle required, HD-over- Coax is the best option for upgrading existing systems from standard definition to high definition, offering longer transmission via coaxial cable and lower total cost. How does HD-over-Coax integrate with my existing analog equipment? HD-over-Coax runs on the same coax cable that your existing analog systems run on. So upgrading to HD-over-Coax is as easy as replacing your analog cameras with HD- over-Coax cameras and replacing the analog DVR with an HD-over-Coax DVR. No special configuration is required. In many cases you may decide to leave parts of your analog system in place and only upgrade some of your analog cameras to HD-over-Coax, or just add some new HD- over-Coax cameras. In that case you would replace / add new HD-over-Coax cameras, and add an HD-over-Coax DVR next to your analog DVR. This is an easy, low-cost, scalable method of upgrading your existing system to HD. 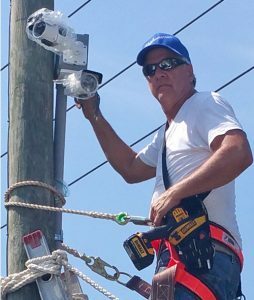 Call us today to learn more about security camera installation in Jacksonville, FL and surrounding areas! What applications should I consider using IP? IP cameras should be considered for large installation sites that already have a high bandwidth network installed – especially if the cameras will be spread out over a wide area, or if wireless cameras will be used. An even better solution may be to use a hybrid solution which combines the use of analog, HD, and IP technology. Analog cameras plug into a DVR using coax cable and can be run up to 1000 feet without any boosters or amplifiers. IP cameras plug into an NVR or hybrid DVR via Ethernet cable and cable runs are limited to 328 feet before needing another switch. The advantages of analog security camera systems are cost and lower hard drive and network bandwidth requirements. The advantages of IP camera systems are much higher resolutions and better wireless functionality. Hybrid security camera systems give you the best of both of these worlds. You can save money by using analog cameras in your less vulnerable areas of your application. And, you can use high resolution IP cameras in your most important areas such as entrances and cash registers. The key component of a hybrid camera system that makes this all possible is the hybrid DVR – a DVR which will manage and record both analog and IP security cameras. Let’s use a car sales lot for example. The DVR and analog cameras are all hard wired via coax in the main building but you want to put a camera out in the parking lot. To do this with analog we would have to trench the line through the parking lot and out to the camera location. With IP it is much easier. We can mount the IP camera and wireless bridge to the light pole and shoot the video back up to 1.5 miles line of site. What’s even better with IP is that we can send multiple cameras over that same wireless connection just by adding a network switch.